This year, let’s boycott Valentine’s Day by celebrating it for every other reason but couples and their love for each other. Just because you’re single doesn’t mean you can’t have plans on V-day. There are so many things we can do instead of sitting at home and sulking while feeling lonely or wishing you were on a Bachelor-esque type date. If you’re single, which very well may be why you’re reading this, let’s just focus on doing some things to celebrate us as individuals. Here are some ideas for how you can spend Valentine’s Day if you don’t have a plus one and quite frankly don’t give a damn. 1. 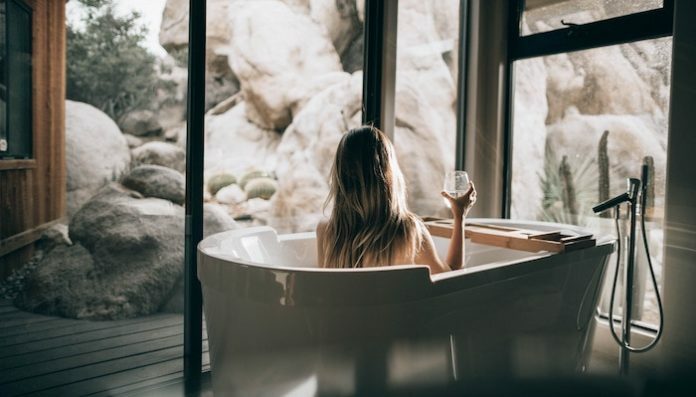 Have a self care night complete with a face mask, mani or pedi, a bubble bath and whatever other products you love that make you feel relaxed, special and fancy. 2. Cook yourself an amazing meal or order something totally unhealthy. 3. Have a sleepover with your friends like the good old days! 4. Go on a shopping spree and get yourself some new outfits to totally regain your confidence (even if you can’t afford it). 5. Have a potluck dinner with your friends. 6. Go to the movies with a friend or watch one at home in bed. 7. Send chocolates or flowers to your other single friends. Or you could hand deliver them to make them feel special and increase your own happiness. 8. Clean your room or apartment and finally declutter. 10. Buy yourself beautiful flowers to put in a vase. 11. Go dancing somewhere new (like a country bar or a club you’ve been dying to go to). 13. Get wine drunk watching your favorite shows. 14. Take a yoga class or some other class you’ve been dying to try. 15. Take your pets to a new park or to the groomers to pamper the true love of your life. 16. Read a new book. 17. Go to a local singles event if they have them in your area. Maybe even bring a girlfriend along for a laugh. 18. Take your grandma out to dinner! (I did this last year since we’re both hot, single ladies and we had such a great time and a lot of laughs). 19. Go nuts shopping at Walmart or Target just because. 20. Start watching a new show you’ve been wanting to indulge in while pigging out on chocolates. 21. Spend time catching up with coworkers if none of you have plans. 22. See a psychic or a medium. 23. Go get a massage to relax and unwind! 24. Watch all of your favorite romantic movies that make you cry every time. 25. Bake a bunch of junk food, put your sweats or pj’s on and binge watch whatever you want with your friend, pet or by yourself. Being single doesn’t mean you have to be jealous of others or be bitter. You can definitely still wish you were on a hot date with your crush, but focus on celebrating yourself or accomplishing things on your to-do list that you’ve been dying to do for a while. At the end of the day, you’ll love yourself more anyway.